1775-1804. He was born at Boconnoc, Cornwall on 19 February 1775, the only son of Thomas Pitt, the nephew of the Earl of Chatham, who became a politician and the 1st Lord Camelford, and of his wife Anne Wilkinson. He was a distant cousin of William Pitt, his brother-in-law was the foreign secretary and future prime minister Lord William Wyndham Grenville, and he was a first cousin of Admiral Sir William Sidney Smith. After living part of his early life at Neuchatel in Switzerland Pitt enjoyed an education at Charterhouse School before entering the service on 9 September 1789 aboard the Guardian 44, Captain Edward Riou, destined for the embryonic colony of New South Wales. He was one of those who remained with the stricken vessel after she struck an iceberg on 24 December, and following an astonishing battle for survival she eventually reached the safety of Table Bay. In September 1790 he arrived back at Harwich aboard the packet Prince of Orange. During March 1791 Pitt joined the Discovery, Captain George Vancouver, as an able seaman, initially participating in that officer’s voyage of exploration to the north-west coast of America. Although he would be unaware of the fact for some time, on 19 January 1793 he acceded to the family title, together with an estate of twenty thousand guineas per annum, following the death of his father. The young lord was a troubled and difficult man however, and on 7 February 1794 he was dismissed his ship at Hawaii for insubordination. After eight months of unrecorded adventure Camelford managed to obtain a passage aboard a trading vessel to Malacca where as an able seaman he joined the Resistance 44, Captain Edward Pakenham, being promoted acting-lieutenant within three weeks. In August 1795 he assisted at the capture of Malacca, leading the unauthorised boarding and capturing of the mud-stricken Dutch armed ship Constantia with the help of another boat commanded by the equally impulsive Nesbit Josiah Willoughby, but not before his captain had realised that the assault against overwhelming odds was sure to fail and had opened fire at long range, giving the Dutch an excuse to submit. On 24 November 1795 Camelford left the Resistance due to the lack of opportunity for advancement in the East Indies, but a country ship on which he had taken passage drove ashore on Ceylon and he lost all his belongings. Once he and his shipmates had been guided to Trincomale by the local populace he took passage to Madras and eventually left that port for Suez aboard the East India Company frigate Swift. He and his companions arrived here in April 1796, took camels overland to Alexandria, and then sailed on to Cattaro on the Dalmatian Coast where he was quarantined for six weeks. Returning at last to England, Camelford quickly became embroiled in controversy when he challenged Captain Vancouver to a duel in order to seek revenge against the man who had unquestionably been severe with his subordinate officers on the Discovery, and who had beaten the young Pitt on three separate occasions. 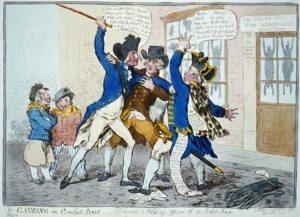 Vancouver refused to contemplate a duel unless a senior officer agreed that satisfaction was called for, so upon coming across his old captain in Conduit Street, London, in September 1796 Camelford attempted to progress the argument with a cane before being dissuaded by some bystanders. He was subsequently bound over to keep the peace. Having been denied the rank of lieutenant because he had not sat an examination, Camelford joined the Tisiphone 20 at Deptford as a midshipman in September 1796, and two weeks later was accepted onto the London 98, Captain Edward Griffith, the flagship of Vice-Admiral John Colpoys in the Channel, who was an officer he found to be friendly and helpful. Having been appointed an acting-lieutenant on 26 October he passed his lieutenant’s examination on 5 April 1797 and was commissioned two days later. Camelford next went out to the Leeward Islands where during August 1797 he joined the Vengeance 74, Captain Thomas Macnamara Russell. Within a month he was appointed to the acting command of the sloop Favourite 16 after her commander, Commander James Hanson, fell ill, but as the Favourite’s first lieutenant, Charles Peterson, was senior to Camelford the only possibility for Camelford to accept the acting command was for Peterson to transfer to the Perdrix 28, Captain William Charles Fahie. During November Camelford’s fiery nature brought about a dispute with a Captain Anderson of the merchantman Kitty over his impressment of two apprentices at Bridgetown, Barbados, and upon drawing his sword and assailing Anderson he occasioned a riot in which one man was killed and another wounded. The blame for the disturbance was levelled entirely at Camelford’s door, and his conduct was labelled ‘derogatory to his station in the Navy and his dignity in the state’. Far more seriously, on 13 January 1798 the unsatisfactory arrangement with Lieutenant Peterson blew up out of all proportion when, in Captain Fahie’s absence, Camelford and Petersen disputed each other’s right to claim seniority when their two vessels were harboured at Antigua. The argument escalated rapidly, and when Camelford’s hasty temper came into play he seized a pistol, accused Peterson of mutiny, and shot him dead. A court martial was ordered upon Camelford at Fort Royal Bay in which he was surprisingly exonerated. Gillray’s depiction of the infamous ‘Caneing in Conduit Street’. In the meantime his promotion to commander had been confirmed by the Admiralty on 12 December 1797, and on 4 May 1798 he transferred into the bomb Terror 8 in order that he could return with her to England where she was paid off in August. His next appointment was to the Charon 44 in October, but before he could join her he attempted to embark upon a trip to Paris, taking the trouble to obtain a letter of introduction to the Comte de Barras from a prisoner of war. After being reported to the British authorities by a suspicious boatman he was interrogated by the Privy Council, and when his explanation that he had been travelling to purchase charts was discounted he was removed from his command. A resentful Camelford now demanded that his name be struck off the Commander’s List, and thus his naval career came to an end. It was not to be an end to his controversial life however, for on 7 May 1799 he was fined five hundred guineas after knocking a theatregoer down some stairs at the Drury Lane Theatre and then beating him further about the head and face. He thereafter spent most of the ensuing summer in Zurich living the high life whilst failing to gain admittance to the Austrian and Russian armies, and eventually he returned to England after obtaining passage aboard the Iris 32, Captain George Brisac. The erratic lord was soon back in trouble, for having offered to take a fellow diner home in his carriage he subsequently diverted to Acton in Middlesex and challenged the man to a duel over some perceived and hitherto unacknowledged slight. When the man, an intimate of Camelford’s cousin, Captain Sir William Sidney Smith, finally managed to escape after a struggle Camelford was hauled before the magistrates and forced to pay sureties as to his future conduct. More bad headlines followed when, during a general illumination west of Leicester Square in London in October 1801 to celebrate the ratification of the preliminaries of peace, he ordered that the house where he was lodging in Bond Street be kept dark. When the mob banged on his door to demand that it be lit up he raged amongst them with a cudgel before being injured and seeing all the windows knocked out. Only the intervention of his friends prevented Camelford from pursuing the argument with a pistol, and eventually a few candles were displayed to prevent any further violence. 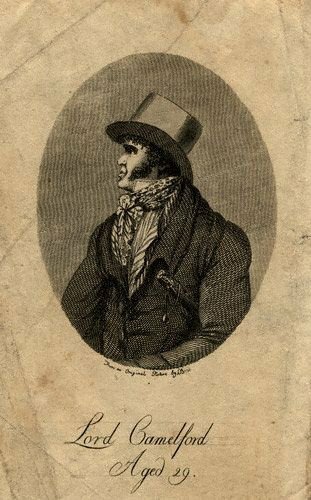 During the peace he appeared in Paris as ‘a Mr Rushworth’, much to the alarm of the French police who were convinced that he was hatching a plan to kill Napoleon. He was arrested in the Tuileries, imprisoned and deported from Boulonge before a diplomatic row could commence, but nothing daunted he tried again, only to be arrested once more, imprisoned in the Temple, and then deported again, from where he made his way to Vienna. Such a life could only end violently, and Camelford’s nemesis arrived in the form of an old friend, Thomas Best, whom Camelford insulted in a coffee-house on 6 March 1804. A challenge followed and on the next morning the two men met near Holland Park. Camelford’s shot missed, Best scored a hit, and the angry lord succumbed to his fatal wound four days later. Even in death controversy surrounded Camelford, for his desire to be buried in Switzerland could not be immediately satisfied due to the war with France, so instead his embalmed body was kept at St. Anne’s Church in Soho where it was eventually lost. His will bequeathed the majority of his £500,000 estate to his sister, Lady Anne Grenville, the wife of the future prime minister Lord William Wyndham Grenville. Unmarried, Camelford had a relationship with Lady Hester Stanhope who ran the household of her uncle, the prime minister William Pitt, until his death on 1806. He lived at Camelford House in Oxford Street as well as owning a mansion in Cornwall. Despite his violent and fiery character he was well read, a keen student of the arts, of mathematics, science and theology, and was both generous and kind to his friends and in particular to those of low standing. Undoubtedly his sanity was open to question, and his eccentricity knew no bounds – at one time he apparently plotted to conquer South America. Wealthy, pampered and short-tempered, he was a keen amateur boxer who was of a handsome appearance, being over six feet tall and powerfully built, athletic, courageous and intensely protective of what he deemed to be his honour. In the Navy he was a harsh but unbiased disciplinarian who nevertheless ensured that his men were well provisioned, particularly the sick. He was not in the least ostentatious; dressing in simple clothes rather than full dress uniform, and he desired a career in the Navy far more than the wealth that was bequeathed him. In the West Indies he shaved off all his hair but wore a huge cocked hat that had seen far better days. A victim of Camelford’s duelling was Lieutenant Richard Stiles Tremlett, the brother of the future Vice-Admiral William Tremlett, who was killed on the island of Martinique having previously been a shipmate on the Guardian. Camelford was great friends with the future Rear-Admiral Sir Robert Barrie and Rear-Admiral Thomas Manby.